So, in mid-February 1562, Ribault set out from Le Havre with two ships and a course charted for Spanish Florida. He left France with 159 settlers and crew, composed largely of Huguenots, like himself. His mandate from Admiral Coligny was to found another safe haven for French Protestants, which would also serve as an outpost for preying on gold-laden Spanish galleons following the Gulf Stream on their way back to Spain. The Queen Regent of France wanted some profit out of this, too. She was a Medici after all. After ten weeks at sea, Ribault’s expedition finally sighted the Florida coast. The next day, May 1, they sailed into the mouth of what is today known as the St. Johns River (baptized the May River by Ribault’s crew in honor of the date of its discovery). After a few days of exploration in the area, Ribault erected a monument on the riverbank, claiming the region for France, and then set off up the coast. On May 17, Ribault’s expedition reached a large sound just north of what we now know as Hilton Head Island and decided to found his colony there. The sound he described as “one of the greatest and fairest havens of the world,” and he named it Port Royal, the name it still bears. On an island in the northeast corner of the sound, the party constructed a small fort, strategically situated on a river they christened “the Chenonceau” after the famous château. They named their settlement “Charlesfort” in honor of their eleven-year-old king, Charles IX. Having established his colony, Ribault set off for France on June 11 so that he could return to Charlesfort with supplies before winter. He left Charlesfort garrisoned with 26 men, armed with eight cannon and the promise of his speedy return. Unfortunately for Charlesfort, however, when Ribault arrived in Le Havre, he discovered that conflict had broken out once again between Catholic and Protestant armies. Ribault spent some time assisting Huguenot forces in nearby Dieppe, but when it became apparent that he would only be bogged down by remaining in France, he turned his attention to England … the Protestant England of Queen Elizabeth I. When he arrived at Elizabeth’s court, he was welcomed and promised a fleet and supplies to carry back to Charlesfort. Unfortunately again for Charlesfort, allegiances at the time tended to shift with the winds, and Elizabeth ended up having Ribault imprisoned in the Tower of London on suspicion of espionnage. Meanwhile, back at Charlesfort, things had not been going very well. Having not planted any crops, the settlers were running perilously short on food stores and their Native American neighbors, the Orista and Escamacu, were either unwilling or unable to help out. An expedition to seek food from the Guale tribe in present-day Georgia came back with some supplies, but soon after their return, the garrison’s storehouse burned to the ground, leaving the settlers worse off than before. Then, two settlers ended up drowning when their canoe capsized. To top it all off, the commander that Ribault had left in charge, Albert de la Pierria, was a bit of an authoritarian, which didn’t sit well with his garrison. He banished one soldier to a nearby island, but it was probably the execution by hanging of a drummer boy that pushed things a bit too far. Eventually, all these factors led to a mutiny and the murder of Captain de la Pierria, and Nicolas Barré assumed command at Charlesfort. By this point, the remaining settlers had lost all hope for Ribault’s return and they decided to sail back to France. With the aid of the Orista, they constructed a make-shift vessel, the hull of which was sealed with pitch and spanish moss. The settlers used their sheets and shirts to make sails, and the Orista gave them rope. In April 1563, in utter desperation, 21 settlers set off for France. (The banished soldier was rescued from his island, but one boy ended up deserting the party and remained with the Orista.) As might be expected, the crossing didn’t go very well, either. After drifting for a while and running out of provisions, the group ended up having to eat their shoes and leather jerkins to stay alive before they eventually resorted to cannibalism. It’s unknown whether he was selected by drawing lots or if they just decided he was the unworthiest of the group, but it was the banished soldier who had been rescued from his island who ended up being served up for dinner. Eventually, the ship and its few survivors (some accounts say there were only seven in the end) were rescued off the coast of Ireland by an English ship, thus closing the tragic chapter of French colonization known as Charlesfort. 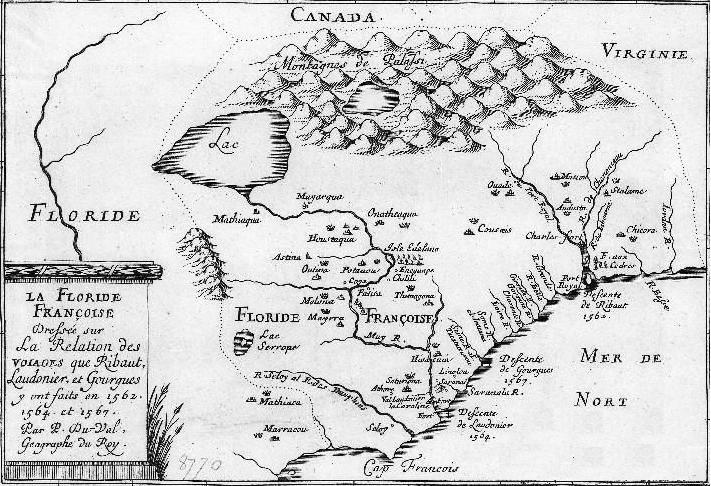 Ribault’s second-in-command returned to Spanish Florida the following year on another colonial expedition, this time to the vicinity of the May River, where Ribault had placed that marker claiming Florida for France. This second French colonial experiment in Florida, called Fort Caroline, didn’t turn out very well, either. But that’s a story for another day. Charlesfort is an important part of our American history, as tragic as its story might be. It’s a legacy that’s being commemorated this week in Beaufort, South Carolina, by representatives from both France and the United States. More about South Carolina that I ever imagined. Where was all my history lessons back then? Hmmmm – and my family were all from NORTH Carolina!! !